The Asus Zenfone 6 is the biggest device in the lineup. It comes with a 6" IPS 720p display and runs on the same Intel Atom Z2580 chipset as the Zenfone 5. As we mentioned before, all Zenfones are dual-SIM devices, and the Zenfone 6 phablet makes no exception. The rest of the specs include a 13MP rear camera, 8 or 16GB expandable storage, and a massive 3,200 mAh battery. In case you've missed our Zenfone 5 hands-on, the Intel Atom Z2580 chipset offers two Atom cores ticking at 2GHz and capable of hyper-threading, PowerVR SGX544 MP2 GPU and 2GB of RAM. The Zenfone 6 is basically an enlarged Zenfone 5 and the only differences are the bigger screen (though at the same 720p resolution), and the higher-resolution 13MP camera sensor. The design is exactly the same, so is the layout of controls. Naturally, the capacitive controls are below the screen, while the front-facing 2MP camera and the earpiece are above the IPS display. The 13MP Panasonic SmartFSI sensor and its LED flash are at the back plus the loudspeaker grille at the bottom. Just like the Zenfone 5, the Zenfone 6's left side is completely bare. The Power/Lock key and the volume rocker are on the right. Our tour ends with the top and bottom sides of the Zenfone 6, where we find the 3.5mm audio port and the microUSB port. 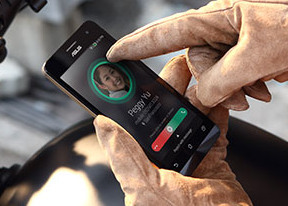 The Asus Zenfone 6 will hit the shelves soon and will start at $199. It will be available in Black, White, Red, and Gold flavors.